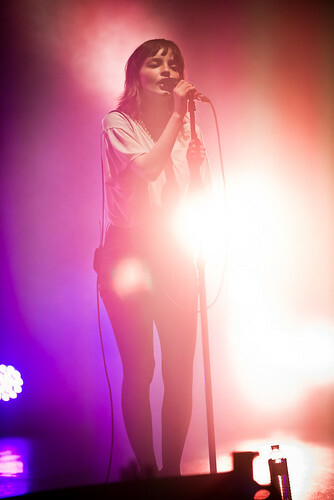 Chvrches perform at the sold out Wiltern Theater in Los Angeles. 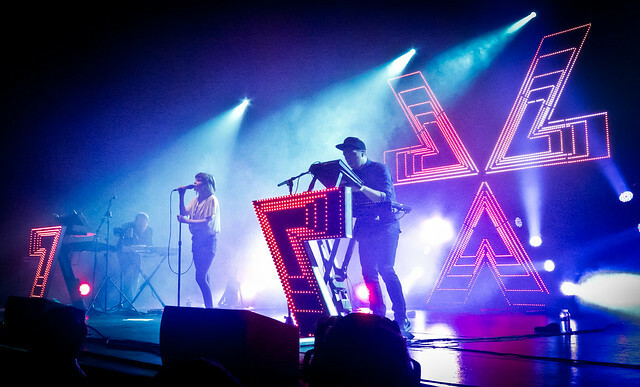 It was a warm November night at The Wiltern where Chvrches, on night two of their 10-city winter tour performed to a sold out crowd of 2,000 last Monday. Halfway into Chvrches set, Martin Doherty took center stage, trading off vocal duties with Lauren Mayberry, and thanked the crowd and our warm southern California weather for allowing him to walk outside in short sleeves in the middle winter. He then smoothly transitioned to sing "Under the Tide" in which he danced front and center in front of the packed house. Coming from Glasgow, Scotland where temperatures, this day, dipped below 40 degrees, this trio, it would seem, purposely planned this tour to start in sunny California - being all warm and all. It's been a busy year for the Scottish trio who have been touring the U.S. off and on since March in support of their breakthrough hit debut album The Bones of What You Believe. But it was their singles "Lies" and "Mother We Share," released last year that began to convert the masses. Based on those two songs alone and subsequent debut EP, they went on tour, selling out venues across the U.S. Their Los Angeles and San Francisco dates sold out so quickly, they had to move the concert to much bigger venues to accommodate the demand. Now, their second time around is no different. The only thing different is that, now, they have a full-length album to tour behind. Chvrches set included all of their songs but one from their debut album and they finally got to showcase their moody tunes - equal parts dark and shiny - in a much grander environment with a slick light show polished with glittery-retro dance melodies. Bathed in saturated greens, reds, blues and oranges, Chvrches' took the stage and opened up to a metronic, beat-driven intro of "We Sink" with lights pulsating and laser cutting the ambient fog onstage. 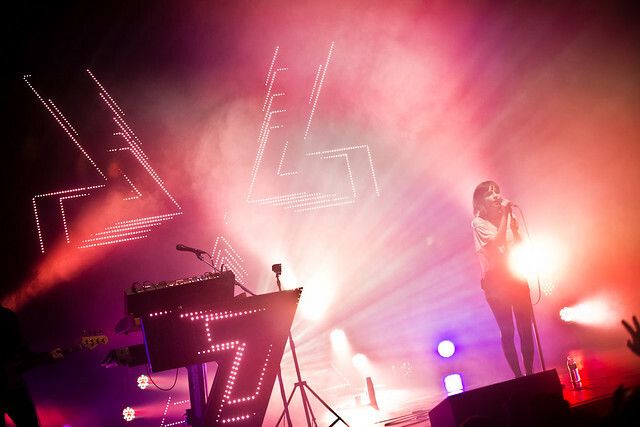 As a backdrop, three sharp-angled "V's" beset with acid-drop sparkling lights that burned like a beacon, often times twinkling and even throbbing to the Chvrches electro-pop beats. 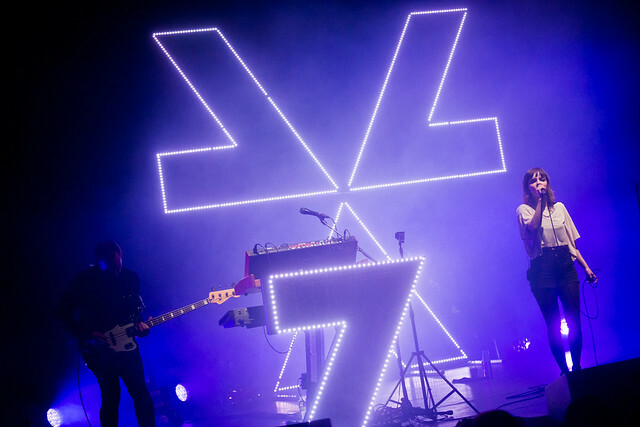 The "V", also used in their name CHVRCHES, aside from the backdrop also dawned Iain Cook and Martin Doherty's DJ stands. Fans danced from above on the mezzanine, in what looked like standing room only looking down at the backdrop which was positioned like a target, with lead singer Lauren Mayberry bulls-eye-centered right down the middle. CHVRCHES are Iain Cook, Martin Doherty and Lauren Mayberry. They kept it going fast and punch-drunk with "Gun" and "Lungs" before they slowed it down with the free-floating, romantic melodies of "Now Is Not the Time," that included sweet, sing-along harmonies. Chvrches' strengths lies in that their songs, when performed live, translate well onstage, sounding exactly like their recorded tracks on their album, especially with songs like "Science and Visions," "Lungs" and "Recover" which are blanketed by layers of melodic beats and sugary-sweet synths. But it's the gem of Lauren's soaring vocals that is the highlight of Chvrches. It's more striking when she's accompanied by minimalistic arrangements like "Tether" and "By The Throat," their closest songs they have to a ballad. Of course, as expected, the highlight of the night was during the end of their set when they performed "Mother We Share" that got everyone on their feet before closing out the show with "By The Throat." 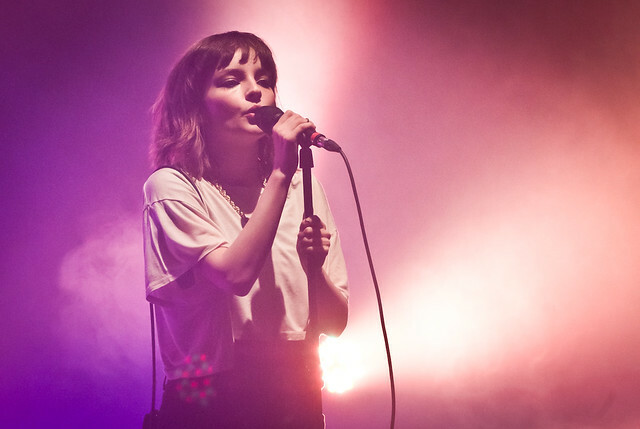 Chvrches perform at The Wiltern, Los Angeles. Since their debut release of their first single "Lies" and then "Mother We Share" a year ago, Chvrches has been put under a microscope as the hype surrounding them grew and grew. Now, with the release of their debut album this past September, Chvrches have met those high expectations and then some.